Editorial: Spring 2019 | Clever H. - the Mag! Welcome to the Spring Issue 2019 of CLEVER H., and happy spring! Isn’t it great when our environment slowly awakens from it’s long slumber? The trees regrow their lush green coat, the meadows fill with the first blooming messengers of the warmer season, and our days become longer and brighter, usually filling many of us with new positivism and a new found zest for action. Unfortunately, for an ever increasing number of people, this time of the year is associated with a suffering that likely diminishes some of the enthusiasm for this change of season. Hay-fever. It can greatly affect the daily lives of many, some more, some to a lesser extent, but, most sufferers have to adapt their lifestyles in order to alleviate the impact symptoms have. The symptoms of hay fever include, among others, the characteristic itching, watery, swollen and red eyes, frequent sneezing and a running and congested nose. Conventional treatment often calls for the treatment with anti-histamine or corticosteroid drugs that each and all have concomitant adverse effects. However, with homeopathy there is a true alternative treatment choice available that has great potential for persons suffering of these seasonal allergies. 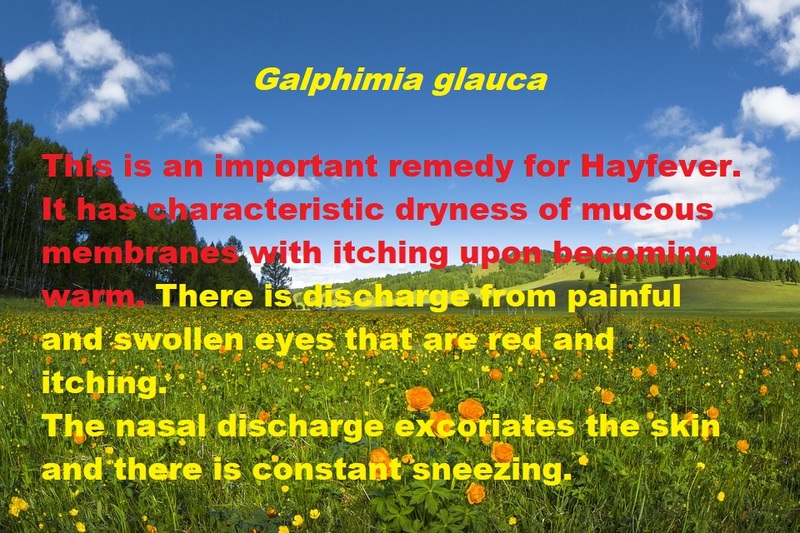 There are numerous homeopathic remedies, matching the diverse symptoms of hay-fever, but I would like to remind of one very specific remedy, namely ‘Galphimia glauca’. Furthermore, this Spring issue features an article by Dr. Renu Madan, who gives a very detailed insight into the topic of ‘Spring-allergies’. Dr. Ronda Behnke, shares a case of ‘the virus that crossed species’, a very interesting case-study involving a sick goat, two sick cats and an unwell baby. Sarah Penrose, shares a detailed case of ‘life-long cystitis and homeopathic medicine’. You can also read the interesting interview I had with Tracy Ferriss, who came up with the idea, and in the consequence created ‘a homeopathic tarot deck’. Finally, a short insight into ‘the homeopathic approach to tooth decay’, by myself, complements this issue. For the coming issue, due to be published on June 1st 2019, the featured topic is: Eating disorders – From binge to bulimia, & other eating habits. If you would like to share a case, or see an article published in that issue, please do get in touch. Please take not that the featured topic is only intended to give an idea, any topic about homeopathy and related areas is welcome to be featured in this or one of the coming issues. If you have any questions, please ask, and if you have any ideas, suggestions or criticism about this publication, please do not hesitate to get in touch and let me know. Have a lovely spring, enjoy the awakening and growth of the season. Happy reading!